But before you start cheering and firing off bottle rockets, you might also want to know that this tale of good ol’ American heroism leaves a very sour aftertaste. Captain Richard Phillips of Underhill, Vermont, may make it out alive, but we don’t feel much like celebrating as the lights come up. His captors, four Somali fishermen-turned-kidnappers, never seem in control for an instant. They’re painted as the bad guys, but, finally adrift in the Arabian Sea, boxed in by U.S. battleship and aircraft carrier, they’re much diminished, the prototypical victims of a bullying superpower. Did British director Paul Greengrass and screenwriter Billy Ray, working from Phillips’ “A Captain’s Diary: Somali Pirates, Navy SEALS and Dangerous Days at Sea,” intentionally set about to milk this ambiguity, to make an anti-American film masquerading as both Navy recruitment vehicle and no-so-veiled warning to would-be aggressors? I’m guessing the answer is yes. Splattered with his captors’ blood, Phillips in the end is at loss for words; he seems as shame-faced as he is relieved. And “Captain Phillips” takes its place as a fascinating metaphorical comment on Third World bullies. As he did on “Bloody Sunday” and “United 93,” Greengrass eschews conventional storytelling. He introduces Phillips and his wife (Catharine Keener) in tight shots with a minimum of small talk. We know they’re steeling themselves for another prolonged separation, but also that their mutual respect and love with see them through it. And when Phillips boards his new vessel, the massive container ship Maersk Alabama en route to Mombasa, Kenya, staccato editing and snippets of dialogue alert us that everything is less than shipshape, that discipline is slack, the crew lackadaisical. They’re the proverbial sitting ducks. And sure enough radar soon detects two skiffs bearing down on the Maersk. Phillips, though obviously alarmed, uses a combination of evasive action and old-fashioned con-artistry to elude the pirates. The next day he’s not so lucky. A boat overtakes the freighter and, as the crew scatters, four armed men hold Phillips and his chief officers on the bridge. What ensues is a deadly game of hide-and-seek. The crew members hide in the engine room, the pirate leader Muse (gaunt newcomer Abdi) and a young confederate force Phillips, who they refer to as “Irish,” to lead them on the grand tour. 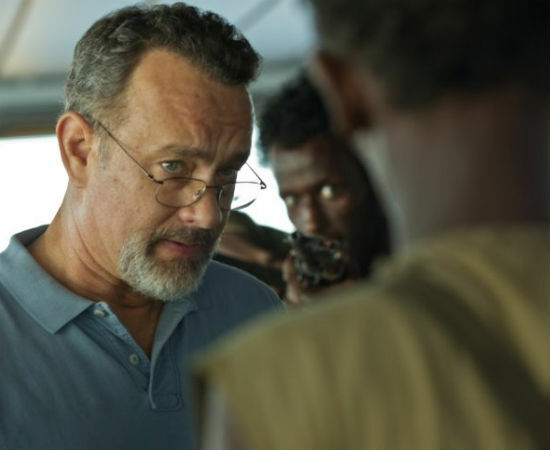 As played by Hanks, Phillips is much too shrewd for Muse and his crew. He patronizes and tricks them. But just as we expect the gunmen to make do with the ship’s cash-on-hand ($30,000) and flee in a lifeboat, things take a turn for the worse and Phillips finds himself adrift with the pirates, who intend to make for shore and hold the captain for a $10 million ransom.